I can't believe what I just saw. I never thought I'd ever be typing this combination of words in this order. Not even in my wildest dreams did I think this was even possible. Force India is on the pole for the 2009 Grand Prix of Belgium. But the rest of the grid is weird, too! Jarno Trulli second? Is this the single most unlikely front row of all time? Grizzly Nick Heidfeld's BMW third? BrawnGP didn't even exist a few months ago, and 4th is disappointing for them now. The BMW of Robert Kubica is 5th, for heaven's sake. Here's the frightening thing: Fisichella and Sutil's speed seems to be legit. They were 1st and 4th in Q1, 3rd in Q2, and obviously fastest of all in Q3. That sort of performance isn't a fluke. Wait, this grid gets even more strange the farther down you go! Look at positions 12 thru 14: reigning driver's champion Lewis Hamilton, two time driver's champion HWMNBN, current driver's championship points leader Jenson Button, and Hamilton's teammate Heikki Kovaleinninnie. All knocked out in Q2, with Button and Hamilton just barely making it into that session to begin with, and all of them behind Adrian Sutil in the other Force India! In fact, the grid doesn't look truly normal until you get to those knocked out in Q1: Buemi, NKOTT, Kazoo and Lettuce aren't strangers to dying in Q1. Then you get Luca Badoer, who becomes the first Ferrari driver to qualify dead last in two consecutive races... EVER! Sixty years and that has never occurred before. And why this sudden burst of performance from Giancarlo Fisichella? Some say that he's been tabbed to replace Badoer after Spa; Fisi for his part has always said that as an Italian, it's been his dream to drive for the Scuderia, and that he'd quit whatever drive he had immediately if it was offered to him. Or it might be down to fuel loads. His 648kg weight is less than Trulli or Heidfeld (656.5kg and 655kg, respectively), but he's heavier than Rubens Barrichello (644.5kg). Or it might just be the Kingfisher that's probably flowing freely tonight in Mumbai. No matter how it happened or how you look at it however, Force India has earned their first ever pole. They were Jordan when I became a F1 fan, then turned into Midlands, then Spyker, then, finally, Farce India. Well, they are a Farce no more. All hail mighty FORCE INDIA! Maybe they'll even earn their first point. Hey, stranger things have happened. The weather forecast calls for just a slight chance of rain, and temperatures in the mid-60s. But this is Spa-Francorchamps; the teams have probably packed parkas, bermuda shorts, and a lot of umbrellas (not to mention snowshoes and sled dogs) into their transporters. The weather is terribly unpredictable and really can change at any time. In fact, during quals today, at one point it was sunny at one end of the track, cloudy at the other, and raining in the middle of the circuit, but NOT where it was actually getting on the driving surface. Your guess is as good as anybody else as to what the weather'll be. Which is one of the reasons why Spa is such fun. Post contains 691 words, total size 14 kb. And this is now confirmed to be Bizarro Season. Man, the top of the list looks like this season's also-ran all-stars. WHAT IN HELL HAPPENED? I love a Cinderella story, and this morning's qualifications was full of them. I hope Fisichella gets his turn with Ferrari--he sure did earn it today. 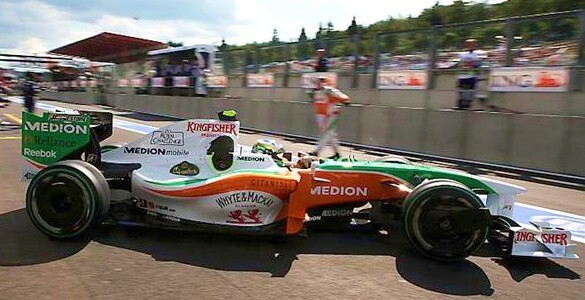 It would be kind of sad if he left Force India mid-season just after finally, finally doing well in one of their cars. Not really too honorable. Presumably Ferrari would have to buy out his contract. 4 WHAT IN HELL HAPPENED? Nothing, that's the amazing part. There was nothing of any note that occurred during quals today that one could point to and say "there is the reason this grid is so weird." The speculation was that, because Spa is the first true high-speed-low-downforce circuit F1 has come to this year, maybe the bad parts of the Mercedes-powered Force India chassis have been masked by the track somewhat, while cars that are better designed for twisty courses have problems at high speed. That actually could be the case; for all I've been picking on them, the one thing Force India has accomplished this year is that they've usually been the fastest car through the speed traps. They've just not been able to deal with the turns. The next race is Monza, which is also a high-speed track. If we've got a Force India on pole there, then we'll be able to say there's something to that. I could have just been a grand harmonic convergence. I dunno what I'll do if they win, though. 35kb generated in CPU 0.03, elapsed 0.2129 seconds. 47 queries taking 0.1823 seconds, 247 records returned.